The Center City District Foundation (CCDF) enables citizens to give back and continue to improve the Center City they love. Created in 1992 as a 501(c)3 nonprofit corporation, the CCDF has been a means for individuals, corporations and foundations to support the Campaign for Real Change funding employment opportunities and services for the homeless; to increase our tree canopy through Plant!Philadelphia; and to support the renovation of John F. Collins, Cret, Sister Cities, and Dilworth Parks. Now you can help create the first phase of the Viaduct Rail Park, add more planters or hanging flower baskets on Center City’s shopping streets, and so much more. Today, as people throughout our region celebrate philanthropy by participating in #GivingTuesday, please consider joining in this collective spirit by making a gift to CCDF. 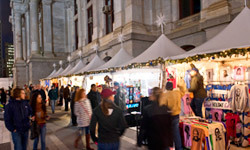 This holiday season, the Made in Philadelphia Holiday Market is open at Dilworth Park, with local artists, crafters, confectioners and designers. Through December 27, holiday shoppers can find unique gifts and special holiday foods, right at City Hall. Philadelphia’s great transit system and pedestrian-friendly streets make car-free travel, shopping and dining easy in Center City; SEPTA.org or RidePATCO.org. Come out December 5, 12-3pm, for a roving event highlighting the best of holiday fashion and mixology. Numerous Rittenhouse Row retailers will host simultaneous in-store parties with cocktails from their best mixologists. 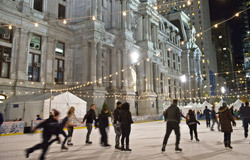 The entire day is free and open to the public- just grab a map at the Rittenhouse Square Holiday Lighting or download one from RittenhouseRow.org. Maps will also be available at Capital One, 1636 Walnut Street, on December 5, between 12-3pm. On December 6, hundreds of foodies of all ages will bask in potato paradise as chefs from Philadelphia’s top restaurants offer their own creative take on the latke (potato pancake). Celebrating its 13th year, Latkepalooza will have chefs from Aldine, Estia, Frankford Hall, Imli Indian Kitchen, Jones, Sabrina’s Café, Tria Taproom, and Whetstone Tavern, with sufganiyot (donuts) by Federal Donuts and ice cream by Ben & Jerry’s! $20 General Admission; $12 Ages 2-12. Bloomingdale's The Outlet Store will offer a range of off-price apparel and accessories, including women’s ready-to-wear, men’s, children’s and home goods- giving fashionable and wallet-conscious customers an avenue for purchasing stylish brands at a compelling price. Come out December 11 at 9:30am when the store opens for business and the 2015 holiday season. Eastern State Penitentiary is partnering with Philadelphia FIGHT's Institute for Community Justice to collect gifts for local children with incarcerated parents. Through December 14, any Eastern State visitor who donates a new toy or children's book in its original packaging (but please no gift wrap) will be granted a second admission free of charge. It’s the most wonderful time for a beer... or is it? It’s the winter of 1777, and the British are occupying Philadelphia. A Red Coat solider provides a unique perspective on this tumultuous time during a tippler’s tour seeking the comfort of hearty snacks and warming drafts at four cozy pubs. Thursdays, through December 17.